In 2014, the most iconic street in Troyes gained three new timberframed houses, built from scratch based on old post cards and engravings from the period. This restoration project proves that history is a never-ending cycle of destruction and renewal, and that the city of Troyes will continue to reveal its secrets for many years to come. actually prevent them from making the leap across. The Rue Maillard in the 15th century was soon called by its inhabitants the «ruelle des Chats» (cat alley), which became its official name. «The roofs, by dint of being contemplated over the centuries, have absorbed a certain shared tenderness. «Cats jump from one attic to another with no danger of a false movement.» Lucien Morel-Payen. 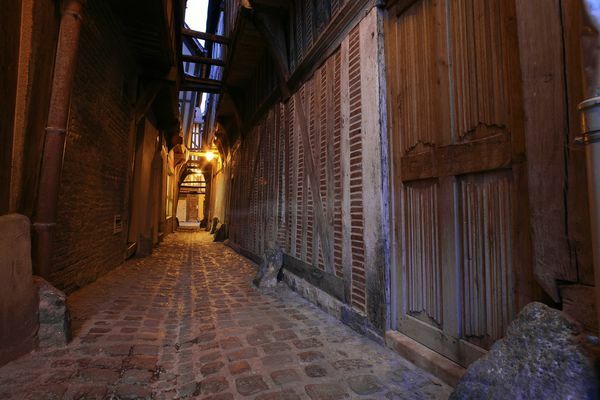 Paved in the old style, similar to the streets of Troyes in the 13th century, the ruelle des Chats has, as was the custom at the time, one central gutter. The privileged classes walked on the upper side of the street, so as not to soil their clothes. Sombre but charming, it leads to the very pretty cour du Mortier d’Or, from which you can view the rear of the half-timbered houses with their beautiful curved galleries. The ends of the beams are sculpted with figures that often evoke warfare; perhaps this place was used by soldiers. The entire area was restored in 1981 by the Compagnons du Devoir. Notice as well the old lighting. In 1534, the city council decided to install public lighting in Troyes during the time of the foires de Champagne, using tallow candles placed in lanterns. In 1766, there were 150 public lanterns lighted in wintertime on the main streets. Tallow made way for oil in 1800 and then gas in 1842. Electricity arrived at the start of the 20th century. The rue du Mortier d’Or used to be part of the rue des Quinze-Vingts. The latter owes its name to the house at n°3, owned by the Hospice des Quinze-Vingts, founded in Paris by King Saint Louis for 300 knights who returned from the Crusades, their eyes having been gouged out by their enemies. The hospice had 15 rooms and 20 beds. Alongside the cour du Mortier d’Or, at no. 25 of the ruelle des Chats, the beautiful half-timbered green house was built in the 16th century for Pierre de Mauroy, Lord of Colaverdey, mayor of Troyes from 1517 to 1521 and relative of Jean de Mauroy, whose restored hôtel, not far from here, hosts the Maison de l’Outil et de la Pensée ouvrière.